“Create in me a clean heart, O God…” is a well-known prayer from the Psalms. It’s context — its back-story — is not so familiar. Psalm 51 is a prayer attributed to David. It is not a quiet prayer. It is a wrenching, sobbing prayer, the words tumbling from David’s mouth in halting phrases and stammers with tears that flood his eyes and stream down his face. Is the secret heart the deepest place in us, the place where God is: the equivalent or synonym for “the inward being” – a poetic parallelism of Hebrew poetry? Or is it, perhaps, the secret place where we hide from God: the hiding place where we go off to a different heart than the Divine heart? Or could it be both at the same time? The Hebrew Psalms are like that. They are not sanitized. They plunge the reader into the conflict between the reader’s own inmost being, the true secret heart, you might say – the heart that pumps life into us – and the secret heart of our own flight from truth and goodness, the heart of deception and self-deception. Why is David crying out? What has he done? What is the sin that is ever before him, the blood he can’t wash from his own hands? Psalm 51 comes in response to an accusation that has exposed the bloody behavior his secretive heart has produced. It is Nathan, David’s commander on the battlefront, who confronts David with the truth. Nathan has just returned from the front to tell David that Uriah, the King’s next door neighbor, a man of impeccable loyalty valor, Bathsheba’s husband, whom David’s scheming heart has sent off to war, is dead! His blood is on David! Nathan has spoken the truth to power. There is no wisdom in David’s secret heart. There is treachery there. Hyssop, the foliage of an aromatic plant named in the Passover story (Exodus 12:21-27), was used in the cleansing of a leper (Leviticus 4:51). The rite of cleansing centers on two small birds. One bird is killed. The other bird is washed in the blood of the other under the flow of water and the sweetness of hyssop. The one bird dies. The second bird lives. David is both birds. He is the one who deserves to die. He is also the one who is living. He lives not because of the secretive heart that had conspired against Uriah, betraying his own inward being – “Against You only have I sinned…” (Ps. 51:4). He lives on because there is more mercy in God (the inward being) than there is sin in him. Goliath’s bullying is almost over. After 53 years, by the good offices of Pope Francis and Canada, and by order of U.S. President Barack Obama and Cuban President Raúl Castro, the U.S.A. and Cuba are taking steps to normalize relations. At long last, Cuba and we will be neighbors again. It’s later afternoon in 1979. A 37-year-old minister/college pastor from Wooster, Ohio is mixing with other guests from all over the world at a social hour on the veranda of the residence of the Rev. Dr. Jose Arce Martinez, Dean of the ecumenical Protestant seminary in Matanzas, Cuba. The 75 international guests at the Matanzas seminary are Christian theologians, bishops, and pastors from Angola, Mozambique, Zimbabwe, South Africa, Argentina, Venezuela, Chile, Mexico, Uruguay, Peru, the U.S.S.R, East and West Germany, France, and the U.S.A. They’ve been convened at the invitation of the seminary with the consent of the government of Cuba following the Pope’s conference on human development at Puebla, Mexico. Earlier that day the guests had stood on the lonely beach of Playa Girón, site of the Bay of Pigs invasion, where the air was still heavy from the deaths of the CIA-led invasion of Cuba that had failed. Being at Playa Playa Girón had been chilling. A Cuban Pentecostal minister who lost a leg in the battle at Playa Girón explained the scene of the American invasion to his North America visitor. That afternoon, they return to the seminary for the social hour where they are joined by a small number of members of the Cuba government. The young minister engages in a conversation with someone named Raúl who asks him what it means to him to be a Christian. He answers that to be a Christian is to be a disciple of Jesus, and that to be a disciple of Jesus means to give oneself to the Kingdom of God. He tells Raul that Marx’s classless society is borrowed from Jesus’s teaching and that he shares that vision. Raúl smiles and says that they will have to see whether it is of God or of Man that it comes. Only time will tell. They shake hands as brothers in a common cause to end human misery and agree that only time will tell. Today Raúl Castro and Barack Obama agreed to pursue normal relations between little David and the giant Goliath. Thanks you, Barack. Thank you, Raúl. Thank you, Canada. Thank you, Pope Francis. Thank you, God! What is the secret heart? Is it the deepest place in us, the place where God is: the equivalent or synonym for “the inward being” – a poetic parallelism of Hebrew poetry? Or is it, perhaps, the secret place where we hide from God: the hiding place where we go off to a different heart than the Divine heart? Or could it be both synonym and antonym at the same time? Psalm 51 is a prayer attributed to David. It is not a quiet prayer. It is a wrenching, sobbing prayer, the words tumbling from David’s mouth in halting phrases and stammers with tears flooding his eyes and streaming down his face like rivers. Hebrew Psalms are like that. The are not sanitized. They plunge the reader into the conflict between the reader’s own inmost being, the true secret heart, you might say – the heart that pumps life into us – and the secret heart of our own flight from truth and goodness, the heart of deception and self-deception. Psalm 51 comes in response to an accusation that has exposed the bloody behavior his secret heart heart has produced. It is Nathan, David’s commander on the battlefront, who confronts him with the truth. Nathan, relying on a fresh report from the front line of battle, tells David that Uriah, the King’s next door neighbor, a man of valor and impeccable loyalty to King David, whom David had sent off to war to secure Uriah’s wife Bathsheba for himself, is dead! His blood is on David! Nathan has spoken the truth to power. And the way that Nathan has spoken it to the King has taken him into the deepest parts that are at war within himself. There is no wisdom in David’s secret heart. There is only treachery. Hyssop is the foliage of an aromatic plant named in the Passover story (Exodus 12:21-27) and used in the cleansing of a healing and cleansing of a leper (Leviticus 4:51). The rite of cleansing involves centers on two small birds. One bird is killed. The other bird is washed in the blood of the other under the flow of water and the sweetness of hyssop. The one bird dies. The second bird lives. David in Psalm 51 is both birds. He is the one who deserves to die. Yet he is also the one who lives. 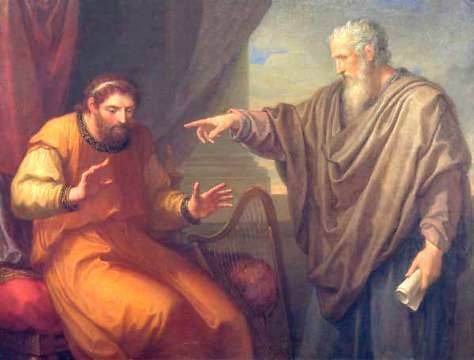 He lives not because of the heart that had conspired against Uriah and betrayed his own inward being – “Against You (God) only have I sinned…” (Ps. 51:4). He lives because there is more mercy in God (the inward being) than there is sin in him. His body quivers as he imagines himself as the bird released into the open field by mercy alone, “according to Your steadfast love; according to Your abundant mercy.” (Ps. 51:1) The inner being – his Deeper Being – has taught his released him for wisdom. Dennis Aubrey of Via Lucis posted Death in the Wood of Ephraim (Dennis Aubrey), a one-of-a-kind reflection on the biblical David and the death of his slain rebellious son Absalom. Dennis and PJ continually bring to the internet something very special: their thoughtful interplay between their photographs of Romanesque and Gothic architecture and commentaries on what they experience while photographing them and researching their histories. If you go to Dennis’s site, please take a moment to comment. Or you may leave a comment here. Thanks to Dennis Aubrey of Via Lucis for sharing Heinrich Schutz’s rendering of David’s lament, “My son, Absalom!” in response to “Holy Tears: David, Absalom…and Us” posted here on Views from the Edge this morning.